When John Wayne arrived in Vietnam in the summer of 1966 to visit American troops at the height of the Vietnam War as part of a tour co-sponsored by the USO’s Hollywood Overseas Committee and the U.S. Department of Defense, he was still in the early phases of developing the 1968 feature film he would eventually direct and star in, The Green Berets. Although one of his goals was ostensibly to do research for a film project that would eventually go on to become controversial for breaking with the era’s cinematic habit of disapproving the Vietnam War, it quickly became clear that the tour held more meaning for Duke beyond his movie project. 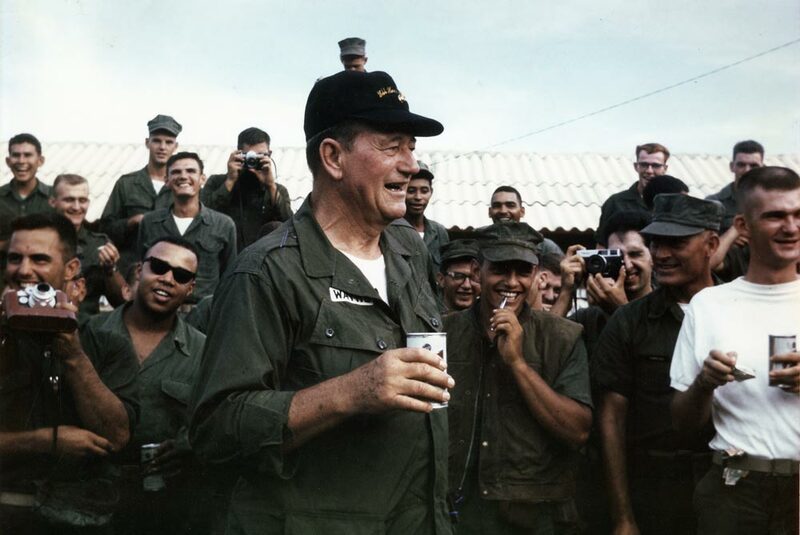 But what Duke didn’t anticipate was how profoundly his time with the troops would impact him, as documents in the John Wayne Archives illustrate. If you read his correspondence from that era, it’s clear that the 1966 Vietnam trip was a life-changing experience for him. Meanwhile, Duke always tried to honor reasonable requests, sign autographs, share anecdotes, and on at least one occasion, he sent cases of strawberry preserves from Knott’s Berry Farm to an entire unit. The gift giving went both ways, of course. On June 23, 1966, several field commanders signed a note to Duke in-country to commemorate a gift they had presented him, taken in furious combat a few days earlier—a Chinese Chicom Carbine Rifle, pulled out of a large cache of weapons from a North Vietnamese ship on June 20. “Please accept the weapon as a token of our appreciation for your visit today and the many hours of enjoyment you have given us all at the cinema,” the commanders wrote. Of course, the most famous gift Duke was given in Vietnam was the silver friendship bracelet presented by a Montagnard Strike Force unit, made up of indigenous Vietnamese soldiers. The bracelet was bent to fit his wrist, and he wore it for the rest of his life. However, John Wayne was ever mindful that the grunts weren’t participating in a movie, and that their effort and sacrifice went far beyond what most people could possibly comprehend. Such understanding was never far from his thoughts, but if he needed a reminder, he got one when he received a letter in February of 1968 from a Mr. and Mrs. Bruce Carpenter of Youngstown, Ohio, informing him that their son, a Special Forces member whom Duke had met in Vietnam two years earlier, had been killed in action. John Wayne wrote them an aching letter of condolence in reply.